A US court has struck down an Illinois law that bans the carrying of concealed guns, the last full ban remaining in the country. In a 2-1 ruling, the 7th US Circuit Court of Appeals reversed lower court rulings on a lawsuit against the ban. The court gave the Illinois legislature 180 days to write a law that legalises concealed weapons. 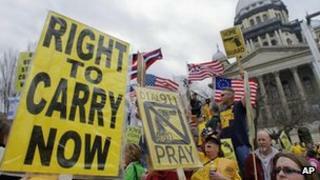 The decision was a major victory for the National Rifle Association (NRA), a major lobby group. Richard Pearson, of the Illinois State Rifle Association, praised the federal court's decision and said the state could pass a law as early as next month. Writing in the majority decision, Judge Richard Posner said that the US Supreme Court had already held up the Second Amendment of the US Constitution, seen as guaranteeing the right to bear arms. "Illinois had to provide us with more than merely a rational basis for believing that its uniquely sweeping ban is justified by an increase in public safety," he said. "It has failed to meet this burden." Both the Illinois attorney general and Governor Pat Quinn, who favours strict gun control laws, said they were reviewing the decision. Illinois House Majority Leader Barbara Flynn Currie told the Chicago Tribune that she hoped the state would appeal, but noted that lawmakers could still work to make a concealed carry law as strict as possible. "If we need to change the law, let us at least craft a law that is very severely constrained and narrowly tailored so that we don't invite guns out of control on each of our city's streets," Ms Currie said. Gun advocates said the ruling gave them a mandate for a permissive law. "The [Illinois] legislature, in the new session, will be forced to take up a statewide carry law," NRA lobbyist Todd Vandermyde said, adding that previous compromises with opponents "are going out the window".